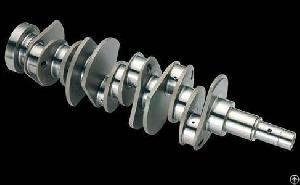 Our company is a leading manufacturer and supplier of Tungsten Alloy Crankshaft at very reasonable price. modern engine is often made from special metal alloys, and much lighter than earlier engines. So the powder and performance of a modern engine are increased. Also, material for crankshaft has been improved, and tungsten alloy is more and more used as the material for crankshaft. The rods and bearings connects the piston to the crankshaft, when the piston moves up and down, the crankshaft is moved as describing a circle by the rods and bearings, then, the crankshaft is rotating. Company Name: Guangxi Chentian Metal Product Co., Ltd.